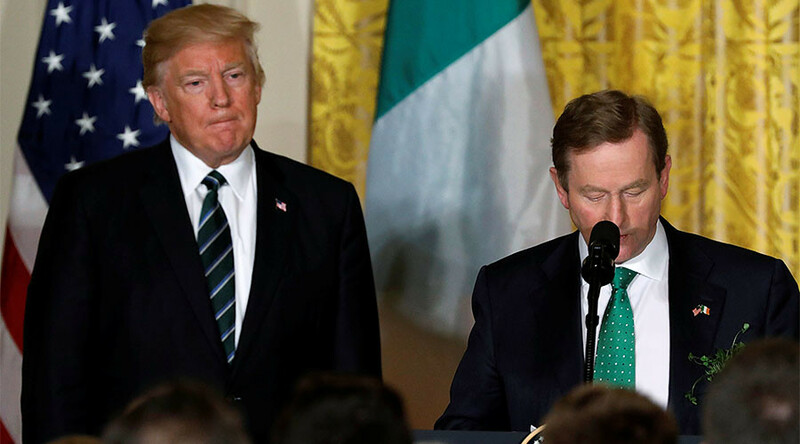 Speaking at a ceremony to mark St. Patrick’s Day, US President Donald Trump shared an Irish proverb that left many people in Ireland scratching their heads and wondering why they had never heard it before. Trump shared the saying at the traditional White House Shamrock Ceremony, which marks Ireland’s national holiday. This year’s ceremony was attended by Irish Prime Minister Enda Kenny. “This is a good one, this is one I like, I’ve heard it for many, many years and I love it,” the president said, teeing up the words of wisdom. The immediate reaction was one of confusion, with many people noting on Twitter that they had never heard it before. It soon became apparent that the phrase wasn’t an Irish proverb at all, but was in fact a line from a poem by Nigerian poet Albashir Adam Alhassan. However, the phrase does incorrectly appear as an “Irish proverb” on various websites, including english-zone.com and Pinterest. TV host Jimmy Fallon later skewered the proverb, seemingly unaware that it wasn’t Irish, by making it into a Dr. Seuss-style rhyme about Trump’s travel ban.